We are open 365 days a year, including weekends and all holidays. We are open 5:00 a.m. to 6:00 p.m. on weekdays and 5:30 a.m. to 6:00 p.m. on weekends. You can call us at 612-871-2505. We staff all three shifts.The best time to come to AAA Labor for job assignments is before 6am for first shift, between 12 pm for second shift, and between 4-5 pm for overnight shifts generally. What is close contact staffing? Close contact staffing is AAA Labor’s unique approach to staffing clients on short notice effectively. Employees are expected to come in person to AAA Labor every day they wish to work. Eligible employees are screened for acceptable cleanliness, attitude and provided safety gear before being sent for work. Having a large supply of employees in front of us as your job order is filled, allows us to quickly fill in the job assignment provide many employees with same day assignments. What types of jobs do you have? We specialize in general labor jobs. An extensive list of job types can be found here. What is the minimum age requirement to work? We no longer do residential work. What do I need to bring with to apply? You will need to come into AAA Labor and fill out a formal employment application. You will need to provide 2 forms of acceptable identification and your Social Security card or birth certificate. If you have worked for us before or previously applied, you will need to update your employment application every 6 months. We do not accept online applications. What happens if my IDs are lost or expired? You may have other acceptable documents you can use and should check the I-9 requirements for alternate options. If you require a replacement ID, be sure and ask for a temporary ID or receipt as proof to bring back to our office. The social security office is a few blocks away from our office and you can apply for a duplicate copy there if you have lost your social security card. You will be placed right away upon your completed and accepted job application if there is an open position matching your skills set. We do not guarantee work assignments, but work very hard to make sure that everyone reporting in each day gets work. How do I get to the jobs? Many of the job sites are located on the bus or rail line near our office. We will give you detailed directions on how to get to the job site using public transportation. Some of our employees have their own cars and are willing to ride share with other employees as a second possible option. Do I have to pay a fee to find work? There are no fees for AAA Labor to find you work assignments. Our goal is to find a job that works in your schedule and matches your skill set. Do you have any long term or temp to hire positions? We specialize in daily assignment labor. However, the majority of our companies are looking for quality talent. These companies will often request specific employees back who do a great job for them when they are available which can often turn into a permanent position. We have several outstanding employees that receive full-time permanent job offers every year. What if I don’t like a job assignment? Not every employee/job assignment is going to be a perfect match. We expect all employees to contact AAA Labor immediately and finish out the current assignment while we work on a replacement for you. AAA employees that walk off a job will not be given additional assignments. We work hard to communicate with our employees and clients to ensure a good working relationship for everyone. Employees are paid weekly and can pick up their checks on Fridays after 10 am.Employees are also eligible to receive a portion of their daily earnings in a cash advance upon satisfactory completion of their shift. How do I order help? You can fill out our request for help form here and someone on our management team will call you to go over the specific job duties and details. How much notice do I need to book help in advance? We recommend a minimum of 48 hours in advance to book your jobs. ASAP requests are also available, but may increase your billing rate and are subject to the availability of employees to fill it. What is included in the billing rate? Our base billing rate includes employee wages, payroll taxes and worker’s compensation insurance. Our rates include considerations for account volume, screening requirements, workers compensation rates and lead times. 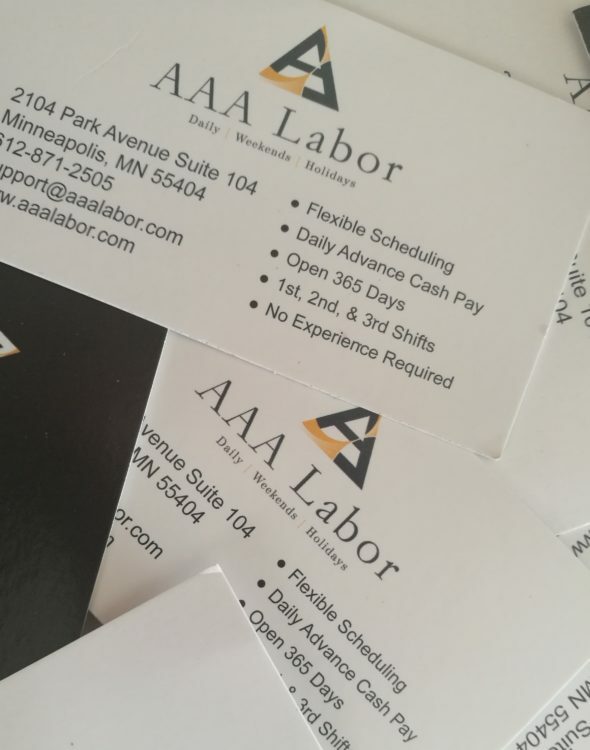 AAA Labor is committed to providing quality help at affordable and competitive rates. AAA Labor employees are paid weekly through AAA Labor by paycheck. Yes, we accept VISA, MC, Discover or American Express. A credit card processing fee may be charged or built in your billing rate. Do you have an employee buyout before I can hire on the employee permanently? AAA Labor has a 160-hour minimum work hours or $2000 early buyout policy. After 160 hours, a client can hire on an employee full-time at no charge. Where can I obtain a certificate of insurance? Email support@aaalabor.com and one will be emailed or faxed to you. Do you provide drug testing and background checks for employees? Upon request, we can arrange for background and drug testing for an additional fee through our third-party partners. Although a rare occurrence, AAA Labor will look for a replacement employee immediately in the event an employee does not arrive as scheduled or performs unsatisfactory work. Why should I choose AAA Labor for my staffing needs? AAA Labor has had the winning formula since 1956. We make it easy and cost effective for you to get help quickly. Let us earn your business for years to come.